With summer upon us we tend to move away from the hearty beef, lamb, pork and venison dishes. 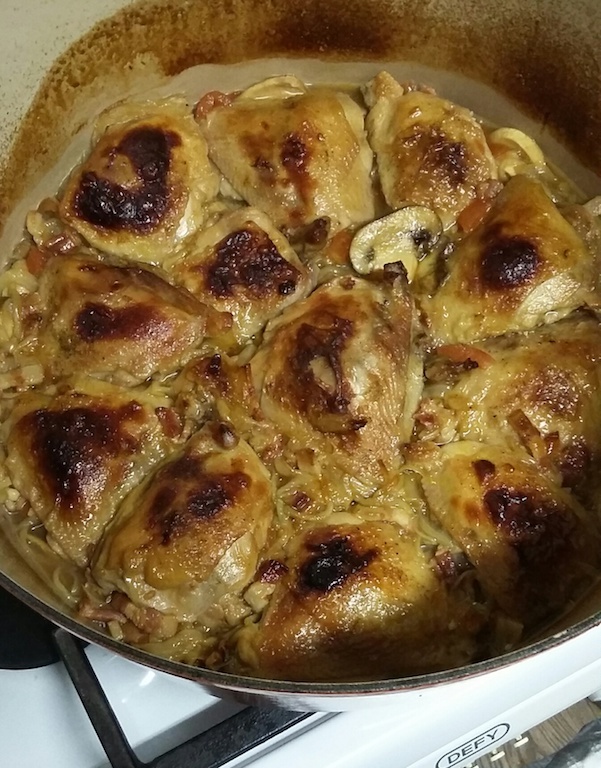 Though for me a chicken casserole always works well in the spring nights which are not always as warm as we would like them to be. Here is a casserole made by Madeleine for our family with what is known as a ‘lang sous‘ – a long sauce. We like the Willow Creek Olive Oils, especially the infused ones as they add so much flavour to a dish. Willow Creek Olive Estate is situated in the beautiful Nuy Valley between Worcester and Robertson. The ideal wine to go with this dish is a delicious bright fruited unwooded Chardonnay like the Limestone Hill from De Wetshof Estate in nearby Robertson. Preset the oven at 180C. Rub the chicken thighs with the olive oil and season with sea salt and pepper. In a large casserole, add a good swirl of both the Willow Creek Garlic Infused EVOO and the Willow Creek Lemon Infused EVOO and brown the chicken thighs on both sides. Remove with a slotted spoon and set aside. Add the bacon and gently fry until crisp. Remove with a slotted spoon. Add the onion and cook slowly until golden brown. Remove with a slotted spoon. Add the mushrooms and tomatoes and cook for 5 minutes. Add the bacon, onion and chicken stock back to the pot and bring to a boil. Add the chicken thighs skin side up and bake for 40 minutes covered, and then 20 minutes with the lid off to crisp the chicken skin. Check sauce and re-season if necessary. If you want to thicken the sauce, remove the chicken thighs to a serving dish and stir through a tablespoon of beurre manie. Allow to simmer for a few minutes. Beurre manie is a mixture of equal quantities of soft butter and white cake flour and is perfect for thickening sauces. We make a 500 g batch at a time and store in the deep freeze in a clingwrap ‘sausage’ ready for use. Serve with Basmati Rice and steamed Broccoli.